The new Canon 270EX II is the smallest flash that Canon makes and it can act as a wireless slave. This means that compatible Canon cameras can trigger and control the flash with a built-in wireless flash controller. Currently, Canon's Rebel T3i, 60D and 7D have built-in transmitters. 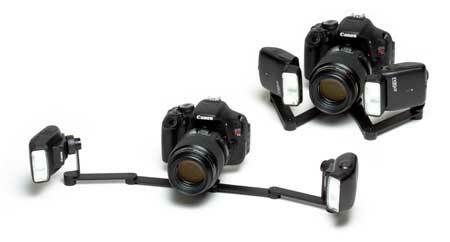 All other Canon models need a Canon ST-E2 wireless transmitter to work with wireless flashes. Shown below is a pair of Canon 270EX II flashes with our R2 dual point flash bracket. a built-in wireless flash transmitter that allows it to work with Canon 270EX II flashes as well as the Metz MS-1 and an articulating LCD screen (that was first seen on the 60D). The photo above shows the Rebel T3i system with the new 270EX II wireless flashes and R2 flash bracket. The Canon 60D is one of only three current Canon bodies to have a built-in wireless flash transmitter. Unfortunately, there was a bug that caused the settings for the transmitter to be reset to the default settings any time you took out the camera battery. We've been waiting for a firmware upgrade to fix this issue and it finally arrived. If you already own a 60D and would like to fix this issue, simply go to Canon's firmware page for the 60D. Download v1.1.0 and follow the included directions. We have a new section on our website where we list any demo/clearance cameras that we have available. We occasionally have demo cameras that may have been used at dental meetings or in dental photography classes. They are thoroughly checked out and include a 30 day return policy and a 90 day warranty. The page changes often - you never know what great deals you'll find! Do you and your staff need help learning to take dental photos? We are regularly asked for recommendations for classes on dental photography. The Dental Photography Courses page on our website currently lists 27 resources for dental photography instruction. Some are continuing education facilities that offer hands-on courses as part of their currriculum - others come to your office and train everyone in-house. If you teach dental photography and you are not on the list, send us an email with a link so we can add you. What would you like to see in the PhotoMed Newsletter?